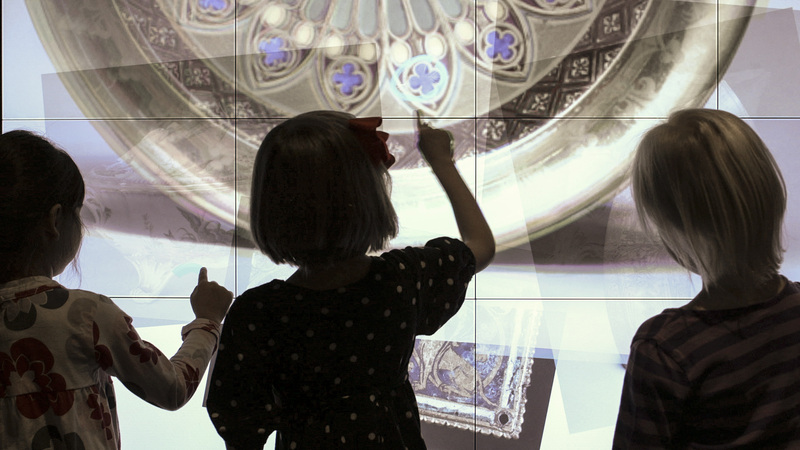 If you are interested in the intersection of museums and digital technologies, then you’ve probably already heard about the Cleveland Museum of Art’s Gallery One, which opened last December to tremendous acclaim and fanfare. It’s not often that art museums get a slick infographic review in Fast Company like Gallery One. Years in the making, and at a cost of ten million dollars, Gallery One is a glimpse at what 21st museums might look like, provided one can get to Cleveland. Here’s a nice promotional piece the museum did. It gives you a good sense of the place. Sounds kinda awesome, right? But does it live up to the hype? One of the problems with complex digital projects with manifold outcomes is that it’s impossible to appreciate or assess them unless you’re there in the flesh. Getting to Cleveland isn’t easy, and making a special trip is hard in these days of tight travel budgets. What’s a person to do? Luckily for us, the wonderful folks at Museums and the Web put together a special event of a kind that I hope the field will see more of. Nancy Proctor dubbed it a “Deep Dive”, a focused presentation/workshop/group happening on one groundbreaking project. For information on the program, look at the agenda. It was a thorough, comprehensive look at the project inside and out, from the perspective of the creators, leavened with my own experience of it, along with fifty colleagues from around the world. The Deep Dive was in a word, perfect. I can’t wait for the next one! What follows is my experience of the event and of Gallery One. As you read it, I’d like you to do me a favor, OK? I thought some parts of Gallery One were amazing, and some parts less so. As you read on (assuming you *do* read on) keep the following in mind. 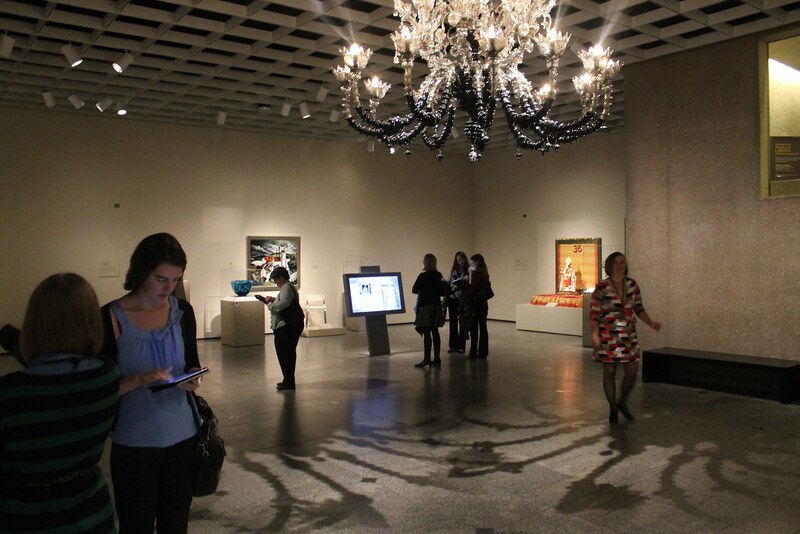 Cleveland Museum of Art has undertaken one of those rare projects that are truly transformative. The scale of their ambition was huge as was their appetite for taking chances, and for that they are to be congratulated. The work that they’ve done on Gallery One will influence the institution and the field for years. Any critical comments I express should be viewed in that context of appreciation. As one of my fellow attendees said, “We could on for hours about how we might change this or that, but it’s all nibbling around the edges.” You may agree or disagree with their philosophy, but Cleveland Museum of Art has made a bold statement about the role of digital media in 21st century museum practice that is well worth a look. The view from Gallery One into CMA’s new atrium. 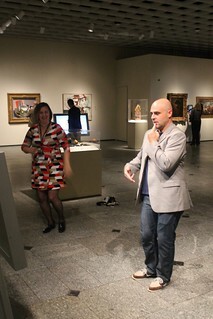 As part of a major building and renovation project, in which CMA reinstalled and reinterpreted the entire permanent collection in new and renovated gallery spaces, they also decided to undertake a project to explore a couple of questions regarding digital technologies and museums: How can we use interpretive technology to engage visitors actively in new kinds of experiences with works of art? 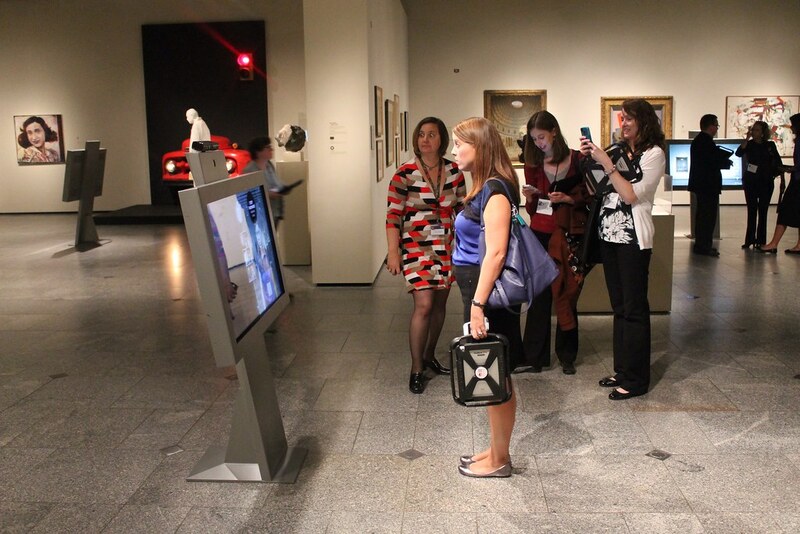 and, What are the best strategies for integrating technology into the project of visitor engagement? At it’s best, Gallery One provides solid answers to these questions. Whether these questions are the most appropriate to ask I’ll get to later. 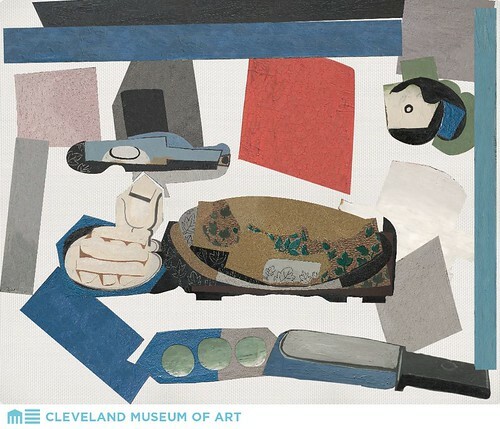 Highlight featured artworks in a visitor-centered and -layered interpretive manner, thereby bringing those artworks to the Greater Cleveland community and the world. These goals are pretty interesting. Audience building, interest building, concentrating a lot of effort in one space. Lots of emphasis on affect. Gallery One has some pretty tall goals, and what isn’t called out in the goals is that Gallery One is the one designated spot where this experimentation is taking place. The rest of the museum, newly rehung, operates much as it did before. 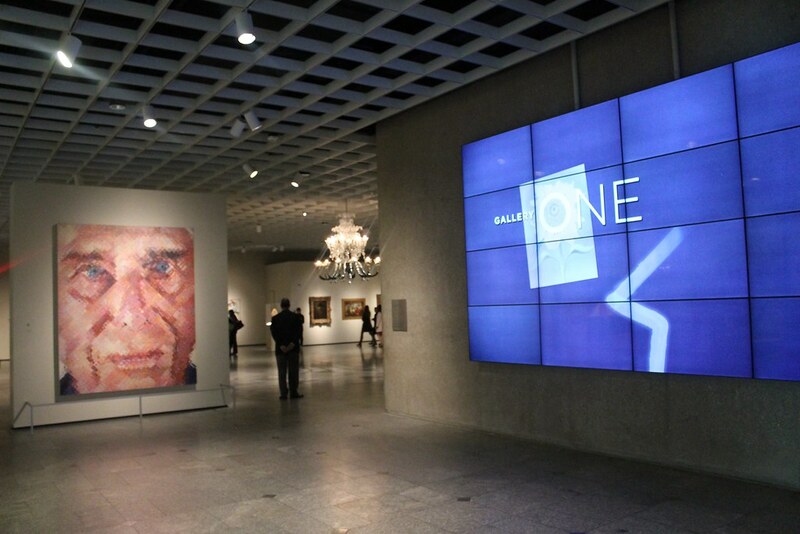 For the technology enthusiasts, and those who worry about this stuff ruining everything, Gallery One would seem to offer something of value – tremendous experimentation and a classic art museum experience, all in the same museum! So let’s take a walk through the gallery and look at what’s inside. 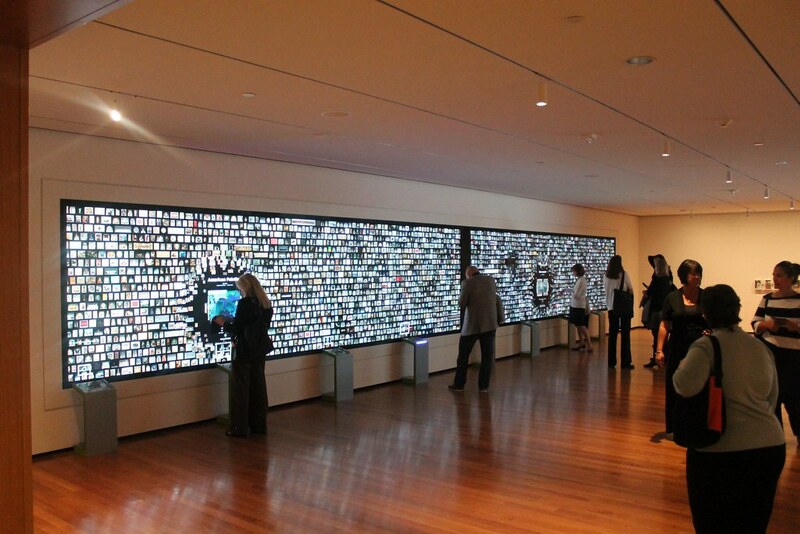 The Beacon is a large dynamic display that welcomes visitors to Gallery One. Paired with a great Chuck Close, it gives you a visual statement about Gallery One’s importance. Increasing their family audience was a goal of the project and Studio Play is placed right up at the front of Gallery One, a big welcoming separate space for young children and families to explore art. 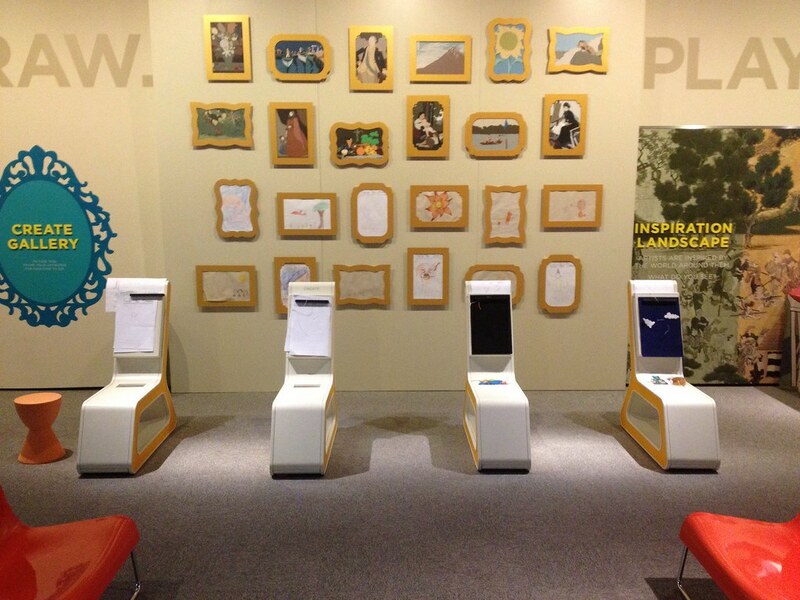 The activities run the gamut from low-tech (pads of paper and crayons) to multiuser, multitouch displays. Drawing stations with different activities. Appealing, no? I especially liked the searching by drawing activity above. When you drew on the screen, the application did some mighty fast pattern matching to find an image in the collection that used that shape. Draw a curve, and you’d see that curve superimposed over the edge of a Persian bowl, or in the design of a tapestry. Trying to find a pattern that could stump the computer (not that I’d ever use an application in a manner it wasn’t designed for…) would result in your drawing getting simplified until it could be matched to an image. It was fast, it was rewarding. 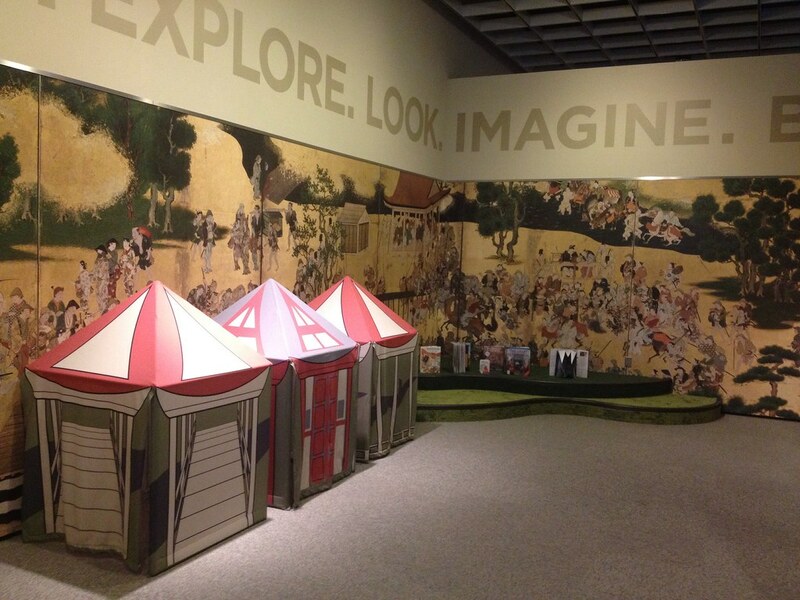 There was also a head-to-head matching game where you and one other person looked at four images from the collection. The narration prompted you to find all the pictures that had a cat, or fruit, or a tree, and as you matched them, you’d get progressively harder challenges. The tone seemed appropriate, the scaffolding solid for young children, and most of all, it required you to study the images to progress. I really liked the choice of images in the game. Not all were obvious at first, and you had to really look sometimes to find the detail that was relevant. On the whole, I thought Studio Play was an uncelebrated gem, from both the design and content viewpoints. One of the Lens in the background. They’re big. Really big. The Lenses are natural group activities, just because of their scale. And the people watching is first-rate! I don’t know if Jim is trying hard enough. At the various Lenses, the emphasis is on looking at the art and reacting to it, in a number of different ways. Mimicking it, using your facial expression to call up similar images, decomposing and remixing a Picasso. 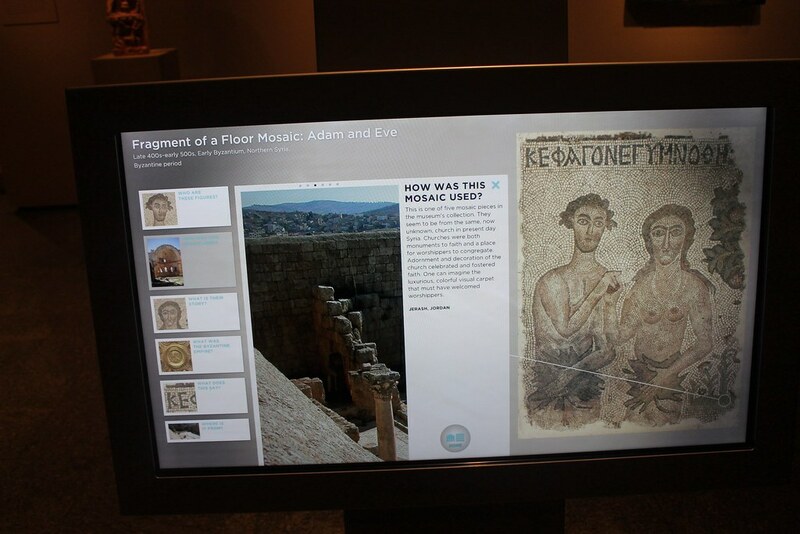 There is also straight-up interpretive content that guides you to look closer at images of the art. 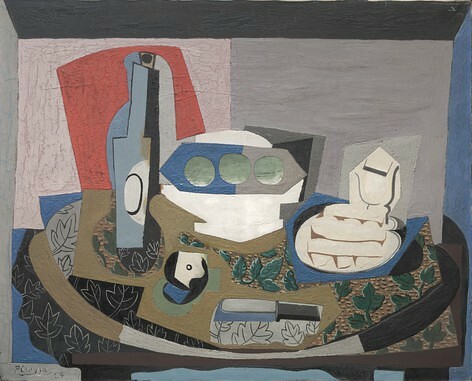 CMA put a lot of effort into finding the right works to feature in these activities, and again, their commitment to the gallery is demonstrated in the quality of the artworks they put in the space. They seem to cover most (if not all) of the major areas CMA collects in, and the wrangling that must’ve been necessary to secure all those pieces for an experiment like Gallery One says more about the museum’s dedication to making the experience first and foremost a great art experience. I shouldn’t quit my day job to become an artist’s model. A sample screen from one of the Lenses. I thought the Lenses were impressive on many levels. The technology worked. The design was minimalist and cool. The execution of the interactives was pretty flawless. The only concern I had was this; I didn’t see many people use a Lens and then go look at the art that the Lens was interpreting. The real things were right there, but the screens were so large and set so far back (10-12′) that even six-foot tall me could only make out the tops of the statues or paintings I was exploring. 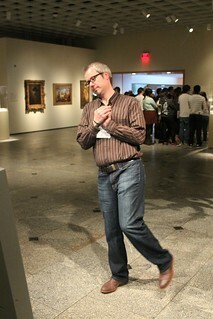 The experience of using my body to interact with the collection was novel and enjoyable. I think we could do a lot more to engage visitors kinesthetically, and this implementation was dynamite. I left wanting more after the end of the interaction. 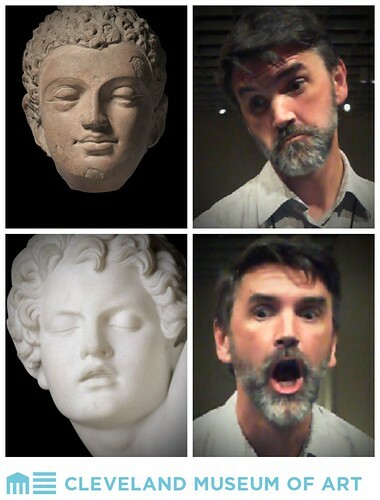 I know all those poses in Indian sculpture have meaning, and it would’ve been nice to know what they signified, and not just how close I came to matching that pose. This was a feeling I had several times in Gallery One – it was fun and memorable, but I wanted some content payoff that I often didn’t get. This was a design trade-off the Gallery One team had to make; the more content, the longer people stay, and the less time they spend going through the rest of the museum which Gallery One is supposed to set up to enjoy more. At some point, as a developer, you have to say, “Enough.” and stick to it. I would’ve gone a little further. It’ll be interesting to see what the evaluation of Gallery One says. I have been doing this long enough to know that I am not the audience and my wants and needs are different from those of the general public. Next up in Part Two, The Collection Wall, the ArtLens app and more! 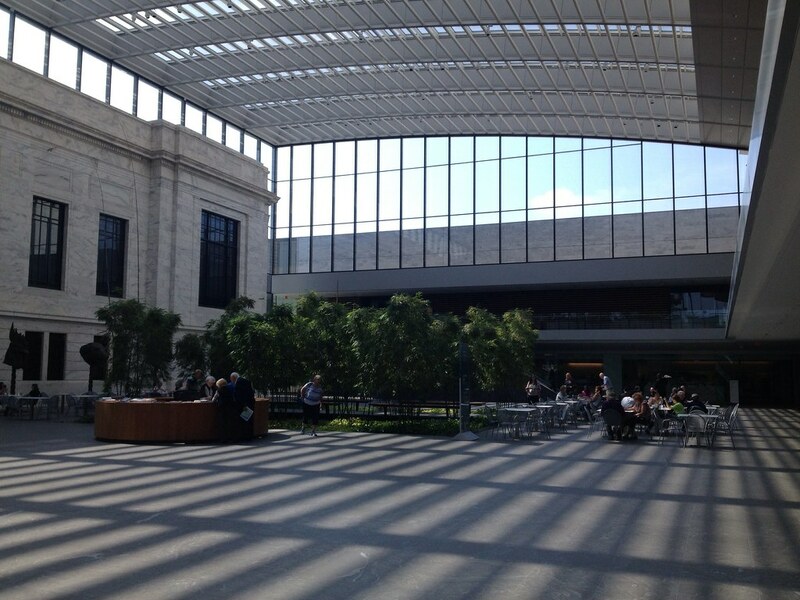 Next Post: Photos from the 9/25 Drinking About Museums! Ed, you’ve made me want to go to Cleveland. I recommend it to anyone now! Cleveland rocks, esp. CMA!